Clearance items cannot be returned or exchanged. Clearance items are not eligible for other discounts. Price reflects discount. Get the deep and restorative sleep you need with Great Sleep® asthma & allergy friendly® Medium Support Pillows designed for Stomach and Back Sleepers. The 300-thread count, soft cotton cover is certified asthma & allergy friendly®— equipped with an allergen barrier to protect against irritants and dust mites. The memory foam-like Dacron® Memorelle® fiber continuously adapts to gently cradle every movement, all while maintaining structured support for your head and neck. This unique material easy on pressure points, so that you can wake up refreshed and rejuvenated after a restful night’s sleep. 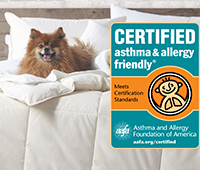 Certified Asthma & Allergy Friendly® - equipped with an allergen barrier that promotes a comfortable night’s sleep. 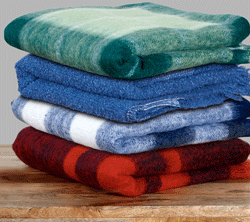 Dacron® Memorelle® Polyester Fiber, offers memory foam-like feel for improved comfort. 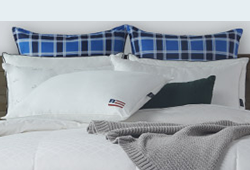 300 Thread Count, soft cotton cover.